Join the Natural Cosmology group at 7 PM on Wednesday, February 6th at UUCWC. This month we’ll start with a Science or Fiction quiz. You’ll get to determine real science from three articles: two Science and one fake. Speaking of fake, our discussion theme is: Fake News and Lazy Thinking … read more. 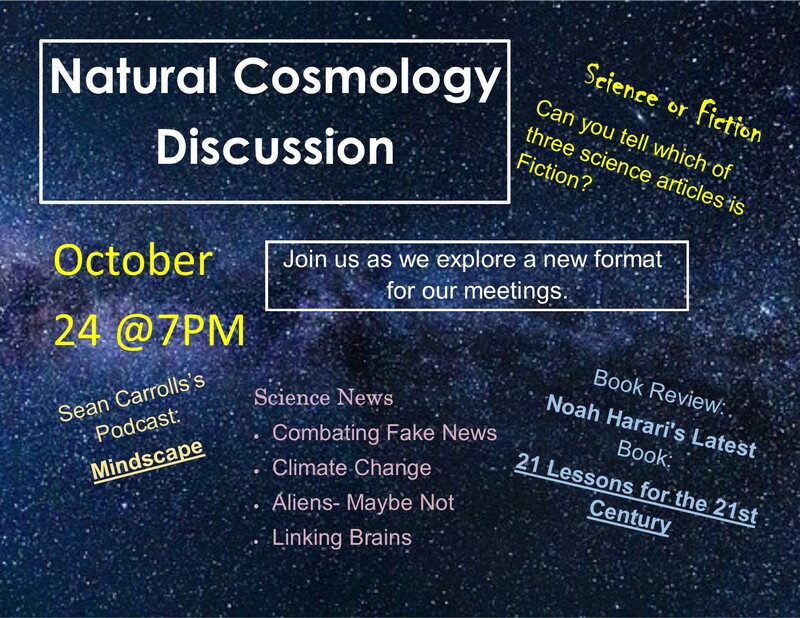 Going forward, the Natural Cosmology group will be meeting on the first Wednesday of each month. Our first meeting of the New Year will be at 7PM on Wednesday, January 2, room 202. This month we’ll start with a Science or Fiction quiz. You’ll get to determine … read more. Join us on Thursday, October 24th at 7 pm in room 203. If you’d like links to the articles and podcasts mentioned here email Ed Dobrowolski. The Natural Cosmology Group Tuesday, November 29 at 7 pm in room 203. The book isn’t just about meditation, but about … read more. Join us on Tuesday, May 23 for the next Natural Cosmology Discussion. In a change of pace, this month Bill Cox will moderate a discussion about the adequacy of empiricism. Are you comfortable with empiricism, alternately, scientific postulating, evidence gathering and interpretation, “materialism,” etc. ? Is there more … read more. Join us for the next Natural Cosmology Discussion on March 28 at 7 PM. Among other topics, we’ll be discussing the new book by Yuval Noah Harari called “Homo Deus”. Consider: We now have the capability to easily alter the human genome and merge our bodies … read more. The Natural Cosmology Discussion Group meets on Tuesday, February 28 at 7 PM. This week we’ll discuss the ideas of Daniel Dennett. Six of us went to see him speak a few weeks ago. Here are links, gathered by George Faulkner, that will fill you in … read more. Natural Cosmology refers to a view that the natural world is all we have reason to believe exists. We see no substantiated reason to believe that one or more deities or divine plans, exist or act independently of the … read more.